An art film. A psychological drama. A movie which spans time and space and shows the vastness of eternity then stoops to look at the mundane. Okay, and this radish represents man's struggle against the hidden urges of his primordial instincts. You either "get it" or you sit there asking yourself, "What the heck is going on?" You either walk out of the theatre saying to the rest of your group that the film maker is a genius or you let them wax laudatory while trying to follow the aphorism "If you haven't anything good to say, say nothing at all." Then again, you could be keeping quiet out of fear of portraying yourself as an ignorant Neanderthal. In a nutshell the film covers a period in the life of a family circa 1940 - 1950. It is a different era; it is a simpler time, then again it is probably no different from any "normal" family. The flow of the story jumps between father Brad Pitt and family, the one grown up son Sean Penn, and an interspersed visualization of the eternity of time made up of special effects, photos of the cosmos, erupting volcanoes and some CGI dinosaurs. Oddly enough, about 30 minutes into the film, we went off on a tangent of esoteric abstract filming which so much reminded me of the film 2001: A Space Odyssey, specifically the part after Dave goes through the monolith and is transported God only knows where. In 2001, this seemed to fit in with the narrative and served well to impress the audience by visually representing something, some force, beyond our comprehension. Here, well, after - what? - fifteen minutes of this stuff, I started asking myself when it was going to end. In fact, with the running time of the film clocking in at two hours and eighteen minutes, there were a couple of times the word "interminable" came to mind. Don't get me wrong, the story of the family was superbly done. Brad Pitt as the father and Jessica Chastain as the mother and the three boys doing what boys do reminded me so much of my own upbringing. Yes, it was truly a different time. Fathers and mothers did what they did as parents and there wasn't any training or any manual to guide them through the trials and tribulations of being parents or for that matter, being husband and wife. For a younger movie goer, the era probably seems totally foreign, but for me, I grew up with those cars, that type of house with those clothes. You succeeded and you failed while trying to do your best. We come back to the interspersed visuals. The film maker is trying to impart the idea of eternity which involved lots of orchestrated choral music. That seems to be the cue we should be feeling the vastness of the cinematic vision. Sorry, it didn't quite come across. In fact, I'd say the film maker could reduce the 2 hours and 18 minutes substantially if he dropped this Ooo and Ah special effects. One minute we're in Waco, Texas in the 1950s, the next minute we're looking at dinosaurs and volcanoes. Yes I get the connection; I'm just saying it didn't impress me. I'm torn. The film is well made. The cast is terrific. Rotten Tomatoes gave it 86% and Roger Ebert decided on four stars out of four, but, and there's my but. Years ago, I saw the film Death in Venice, all two hours and ten minutes of it. This was an art film, a psychological drama and I walked out with the impression that nothing happened. Yes, my recollection was that there was literally no action. Nevertheless, I sat through the film absolutely mesmerised. In The Tree of Life, I loved the scenes with the family but the abstract visuals which broke up the narrative didn't come across at least to me as impressive and thought-provoking as I imagine the film maker intended. Okay, maybe that's just me. As I said in the beginning, this is more of an art film. You have to have a certain taste and you have to be in a certain mood. If your bag is something like X-Men or Thor, you are probably not going to take to this one. If you enjoyed Midnight in Paris, you should probably go for this one but it ain't no comedy. So, good film, well done, but with a caveat. Terrence Malick's singularly deliberate style may prove unrewarding for some, but for patient viewers, Tree of Life is an emotional as well as visual treat. 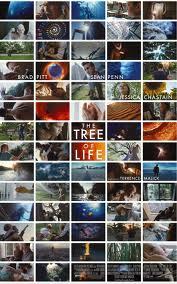 The Tree of Life is a 2011 American drama film written and directed by Terrence Malick, and starring Brad Pitt, Sean Penn and Jessica Chastain. Malick's film chronicles the origins and meaning of life through the eyes of a 1950s Texas family, while also featuring sci-fi and surrealist themes and imagery through space and the birth of life on Earth. The film premiered in competition at the 2011 Cannes Film Festival and won the Palme d'Or, after being in development by Malick for decades, and experiencing a delay from its original release in late-2009. It later opened in limited release on May 27, 2011 to positive reviews on its technical and artistic merits, yet also received polarizing reactions in response to Malick's directorial style and, in particular, with the film's fragmented and non-linear narrative. Greenpeace convinces Ken to leave Barbie!